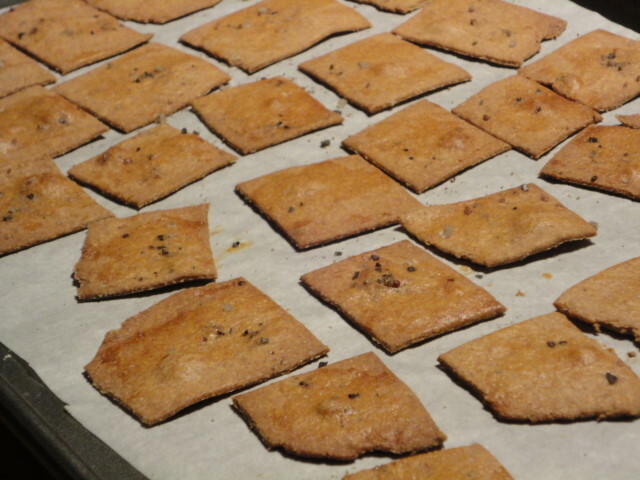 I’ve been wanting to make crackers for some time, so when I saw this Peter Reinhart article in the Los Angeles Times I knew I had to try it. Peter Reinhart is a home baking evangelist, author, and all-around bread god. 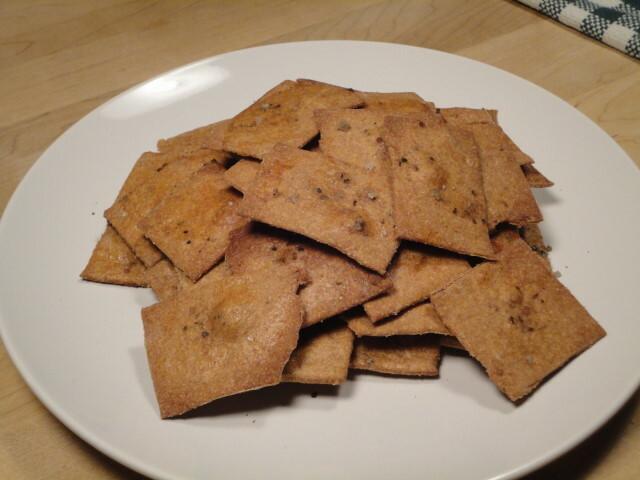 I chose to make his wheat cracker recipe from the article, and they came out great! Since this isn’t my recipe, I’m not going to post it here. I doubt that Mr. Reinhart would mind, but unfortunately there are people who might! The next step was to combine them into a loose dough. 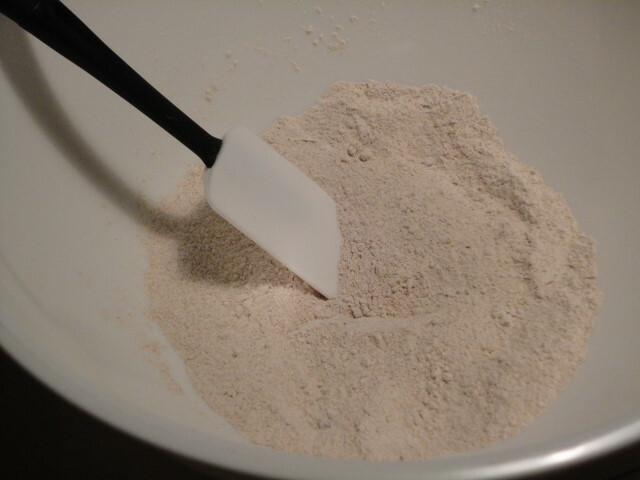 Next, I dumped the dough on a floured surface and kneaded it until it formed a smooth ball. 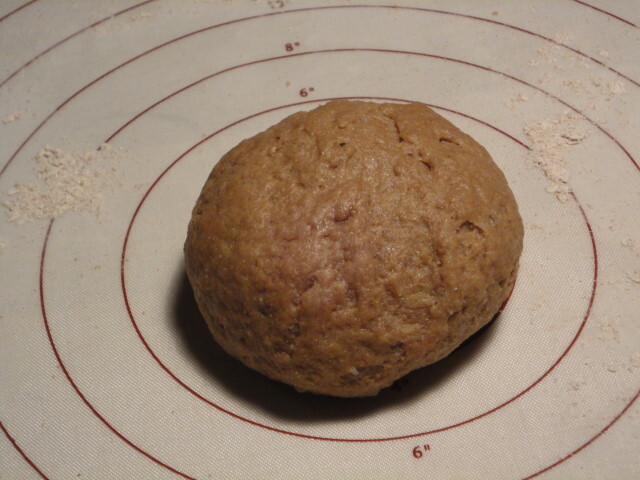 After setting the oven to preheat to 290° F, it was time to roll out the dough. 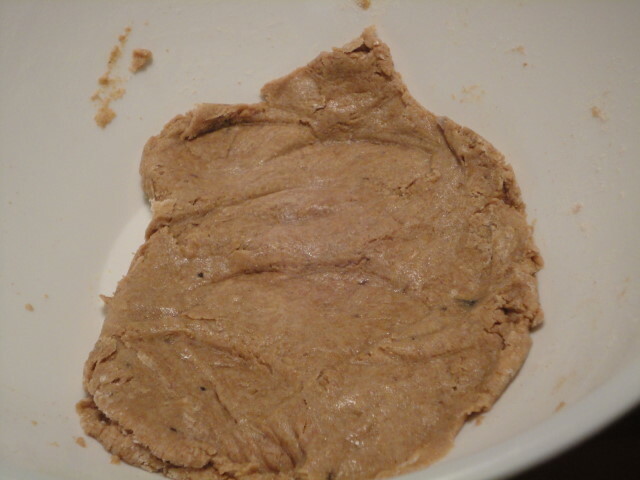 The original recipe says to cut the dough into three parts, but I cut it in two. 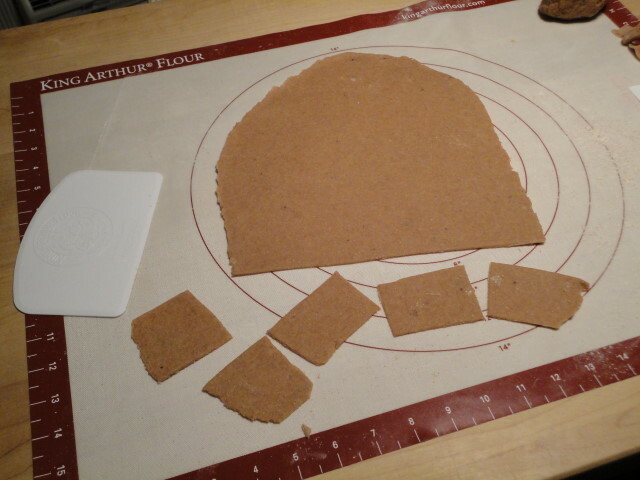 Then I rolled out one piece as thinly as I could. I probably should have made it thinner, but the end result was fine. You may notice that the recipe actually says to roll them out, then egg wash them and garnish, and then cut them into cracker shapes. In my excitement, I mixed up the steps. It didn’t make much difference, but it sure would have been easier to egg wash the dough uncut. 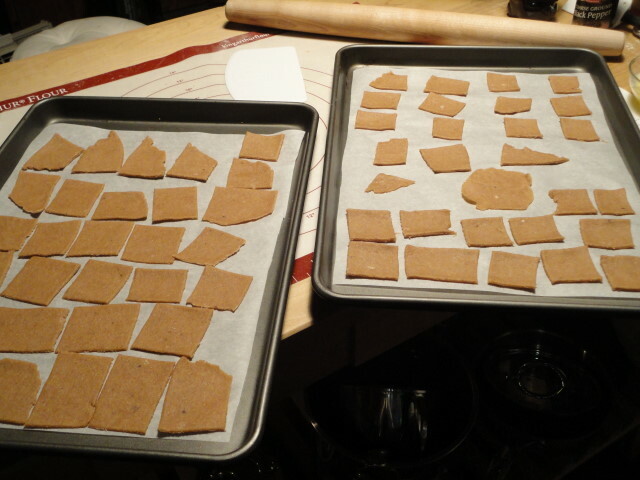 I placed the crackers on sheet pans lined with parchment paper. Okay, so they’re not all perfect little squares. These are homemade crackers…anything goes! 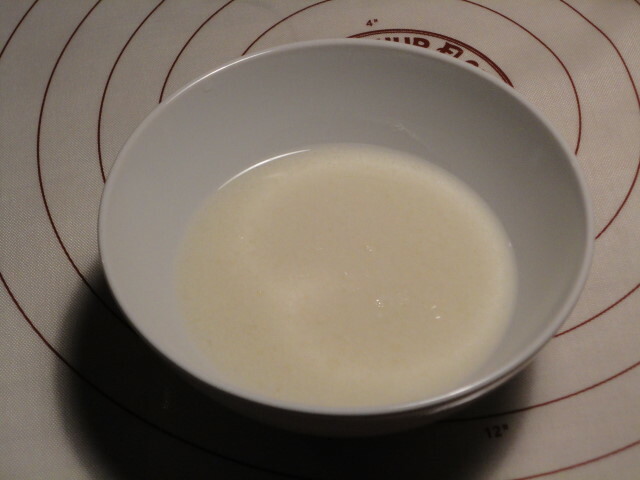 Next I applied the egg wash and garnished with more sea salt. I actually used a salt blend that I had lying around, but regular sea salt would be just fine. Then both pans went into the oven. The recipe says to rotate them (switch racks) twice, with eight minute intervals, so I did just that. Then I let them bake another 8 minutes or so until they were browned and took them out. Not bad for a first try! They’re very good, especially with something on them. 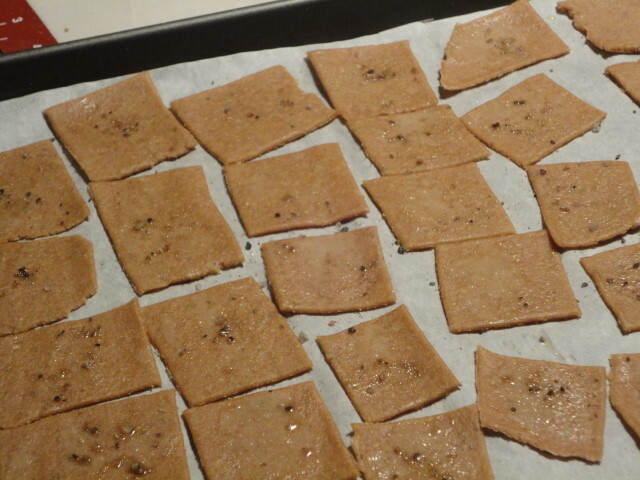 (Like ham salad, perhaps…) The nicest thing about making your own crackers is that you can decide what goes into them. I’m going to try some more cracker recipes in the future, so stay-tuned!